Water Damage In Your Home Or Business – Could Dezincification Be The Cause? As you can imagine, dezincification, or removal of the zinc from brass, is not good for the brass. The addition of zinc to copper strengthens the copper, making it stronger. When the zinc is removed, it leaves behind holes, or voids, in the brass that act a lot like perforations in the metal, making it weaker than pure copper. 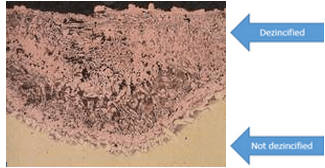 See image* below, which shows dezincification that had 42% zinc. After a time, the brass easily tears apart along the perforations. When you experience a loss due to water damage, ARCCA’s metallurgical experts will perform the necessary inspections/examinations to determine how the failure occurred and how it can be corrected.